While e-readers clearly aren’t going anywhere (how else would we dodge strangers attempting to make conversation on the L train or read Fifty Shades of Grey discreetly? 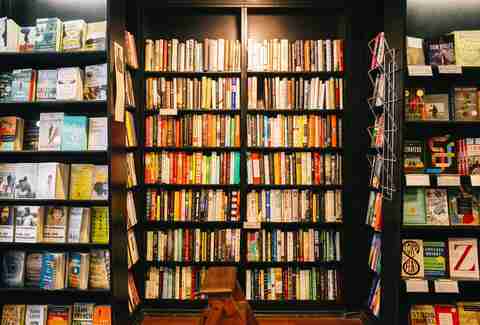 ), they do pose a problem for paper publishers: As the necessity for three-dimensional books dwindles, so does the necessity for the brick-and-mortar bookstore. 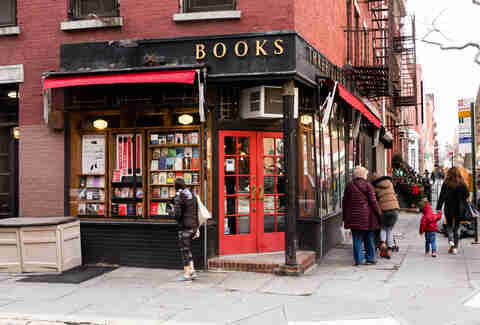 In an era when some of the city’s most beloved shops are closing (including Cobble Hill’s BookCourt, which has been a Brooklyn staple for 35 years), and Amazon is (very ironically) opening a bookstore in NYC, it’s never been more important to support the independent shops where New Yorkers still read. The Strand -- the city’s premier independent book emporium -- might still attract plenty of attention (and tourism), but New York is also home to a number of other, perhaps more understated, indie bookstores deserving of your patronage. True to its maxim, “98% Activism, 2% Glitter,” Bluestockings is a volunteer-run, collectively owned bookstore, powered entirely by women. The name is derived from the badass 18th-century English collective "the Blue Stocking Society,” established to promote literature written for and by women. The New York bookstore/fair-trade cafe/community space was founded in 1999 as a way of paying homage to those very ladies. Today, Bluestockings hosts screenings, discussions, and speakers nearly every night, in addition to carrying over 6,000 books, journals, and zines. 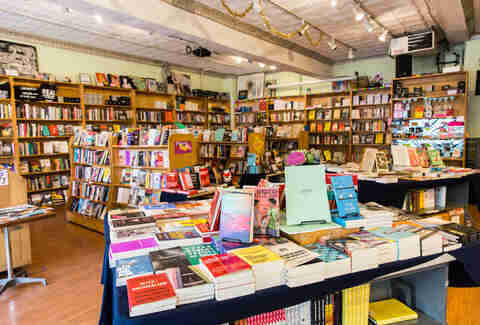 Part open forum, part literary haven, part girl-gang home base, Bluestockings is something of a Lower East Side staple. And the vegan cookies aren’t bad, either. Recommended reading: Bluestockings’ staff recommends Amitav Ghosh’s The Great Derangement -- a non-fiction work on the absence of discussion around climate change. Three Lives is a self-proclaimed anachronism. Named for a Gertrude Stein novel, the red-brick corner bookstore is every bit as humble and austere as it was at its founding in 1968. The volumes stacked inside have little to no visible organization to them -- but the blatant lack of order has a purpose. Three Lives wants customers to stumble upon titles serendipitously, through the process of wandering (though, if you’re looking for something specific, the well-informed staff can quickly find any work among the deliberate chaos). Built of crammed, black-framed window displays divided by a set of dual red doors, Three Lives was called “a pocket of civility” by the Greenwich Village Historical Society in 1991. The place continues to feel something like a public living room. Recommended reading: Three Lives & Company’s staff recommends Our Young Man by Edmund White, a Dorian Grey-esque novel tracing an astonishingly handsome Frenchman’s attempts to navigate the New York fashion world through the ‘70s and ‘80s. Before Gowanus was a dining destination and Park Slope was a haven for moms on juice cleanses, there was Community Bookstore. The shop itself has remained fairly unchanged since opening in 1971, while the surrounding Seventh Ave real estate has shape-shifted without pause. 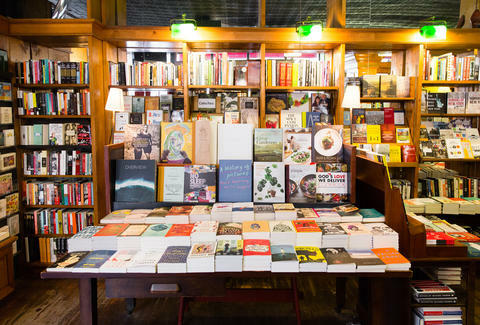 With an expansive collection of contemporary titles, a variety of used books, and a backyard garden reserved for readers, the little emporium is rarely empty. The red-brick space is typically filled with after-school crowds and long-time Park Slope natives (plus a cat and a turtle), browsing, reading, and attending author-talks. And the staff, in addition to knowing the shop’s textual archives backwards and forwards, seem to know nearly all of the shop’s most loyal patrons by name (including the cat: Tiny the Usurper). Recommended reading: Community Bookstore’s staff recommends The Sellout by Paul Beatty, a largely satirical novel detailing a young man’s isolated youth, ultimately leading to a race trial that lands him in the Supreme Court. 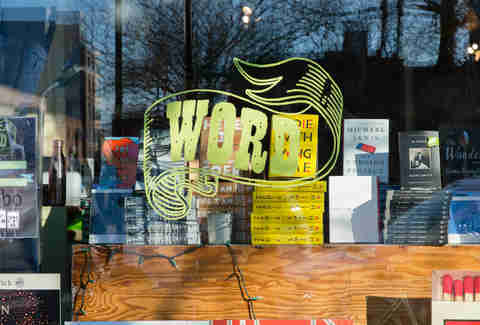 Among the youngest of the bunch, WORD might be New York’s best bookstore for securing a date. If you have yet to meet your one-and-only on the Lorimer St platform, while coincidentally reading matching paperback copies of Infinite Jest, you might instead consider joining WORD’s basketball league. Founded in 2007, the Greenpoint-based social-club-meets-bookstore is all about fostering a community grounded in literature, but perpetuated by actual human interaction -- that means bar nights, potlucks, and pick-up sports. 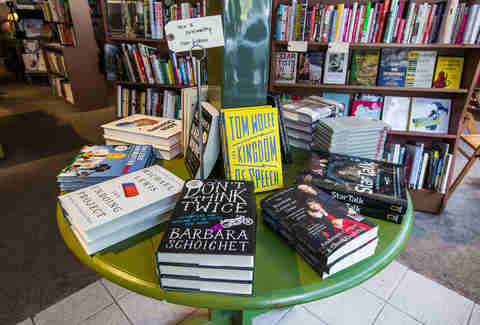 With less than 1,000sqft to its name, the bookshop carries hundreds of titles, focusing heavily on paperback fiction. There are bulletin boards for roommate-seeking bibliophiles, witty cards marking staff recommendations tucked between spines, and recently a cartoonist was invited to draw personalized tattoos onto willing readers. Like the book-based frat you never had, WORD is all about cultivating relationships -- and, well, words. Recommended reading: WORD’s staff recommends Sonya Chung’s The Loved Ones -- an interweaving tale of unlikely connection and consequence spanning massive generational and cultural divides. Stationed in the heart of SoHo, McNally is the go-to indie bookstore for Manhattan’s flightiest freelancers. All of the literature in the dual-floored book depot is organized by country, and the shop’s entryway is lined with travel zines and journals, several of which are self-published. 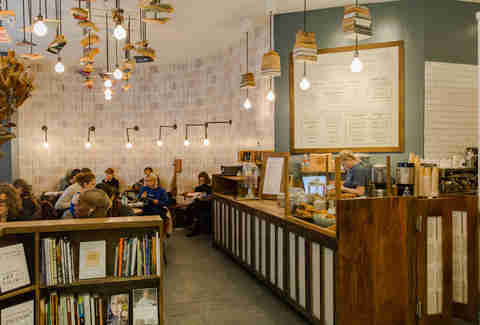 There’s a narrow cafe tucked into the bookstore’s upper level with a full-service barista, and the lower level hosts regular readings, author talks, and a variety of book clubs. But McNally is not simply a venue for reading, purchasing, and discussing books -- it’s also a venue for making them. An “Espresso Book Machine” sits among collections of novels, capable of converting PDFs into full-length cover-bound paperback books in minutes. With the aid of McNally’s small self-publishing department, patrons select from pamphlets of available formatting, font, and cover templates, and the machine does the rest -- something of a self-publishing miracle for New York’s greatest (or not so great) undiscovered writers. Recommended reading: McNally Jackson’s staff recommends The Journalist and the Murderer by Janet Malcolm, a non-fiction exploration of the journalist’s psyche, with regard to emotional investment, journalistic ethics, and the necessity for objectivity. Western Queens was something of a literature desert, barren and bookless, before The Astoria Bookshop came to be in 2012. Funded almost entirely via an online crowd-sourcing campaign, the cause hit home (literally) for plenty of text-hungry Astorians, tired of having to leave their borough to find something decent to read (the shop is still the one and only general bookstore in the area). The tiny storefront curates its collection based on local demand -- for the time being, that’s largely contemporary fiction. It also hosts a weekly story time, a monthly book club, and a series of writing workshops -- as if creative types needed more reason to flock to the outer boroughs. Recommended reading: The Astoria Bookshop’s staff recommends The Good Lord Bird by James McBride, a novel set in 1850s Kansas, charting the life of a young slave and the abolitionist he sets out to escape alongside. Eliza Dumais is a native New Yorker who would sooner die than purchase an e-reader.